Brian Noone said he had not been asked to supply a list of entities with whom his firm works. 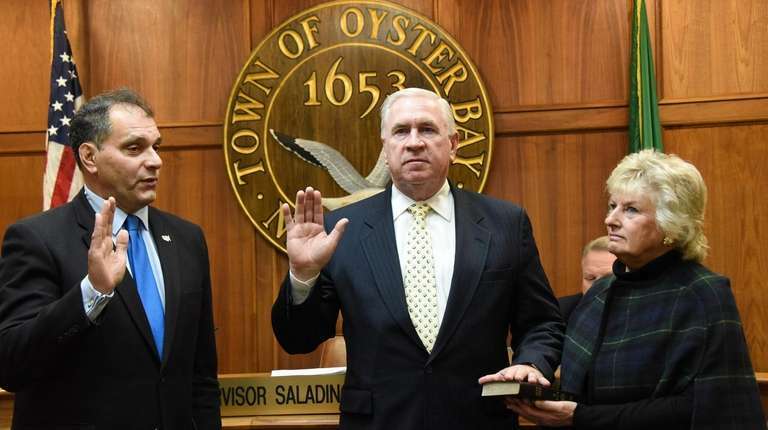 Two Oyster Bay town board members on Sunday called for the new inspector general to resign for not disclosing past contracts with the Nassau County Industrial Development Agency. In a joint written statement, Councilwoman Rebecca Alesia and Councilman Anthony Macagnone said Brian Noone, who was appointed inspector general on Jan. 8 to oversee town contracting, should step down or the town board should rescind his appointment. They cited a Newsday story published online that included details of the contracts, saying it raised questions about his suitability. “He did not disclose this information even after being asked by the hiring committee multiple times about government affiliations and relationships of that nature,” they said in the statement, adding Noone should have known the IDA contracts would be of interest to the town. “As a candidate for a job ferreting out impropriety, failure to reveal a municipal contract during the interview process indicates that Noone was not candid or transparent,” Alesia and Macagnone said in the statement. In a statement Sunday, Noone said he has "been honest, transparent and forthright throughout my career" and would respond to any future questions by the town board. "While the search committee asked questions regarding my political affiliation, it did not ask for a list of entities for which my company performed work," Noone said in the statement, adding, "I look forward to working with all members of the town board." Town officials did not comment Sunday. Noone previously worked as an outside consultant for the Nassau County Industrial Development Agency where he was among its highest paid vendors, records show. State and IDA records show he and his company The Noone Group were paid $564,750 for consulting on homeland security and cybersecurity from 2011 through 2017. Most of the payments were made directly to Noone, not his company, the records show. IDA resolutions show Noone was hired on an as-needed basis reporting to then-IDA executive director Joseph Kearney. Kearney declined to comment. The term for the inspector general was supposed to be for three years under the town code, but Noone was appointed to serve 23 months instead, starting the $135,000-per-year position on Jan. 31. The change to a 23-month term was made so that Noone's tenure was not tied to town elections, Oyster Bay spokeswoman Marta Kane said in an email. The town supervisor and town clerk serve two-year terms. The tax receiver and town board members serve four-year terms. “A two-year term bolsters the independence of the office by authorizing the inspector general to function in non-concurrent terms with the town election cycle," she wrote. The truncated term came as a surprise to Noone. “I thought it was three” years, Noone had said in an interview Thursday. After his appointment to Oyster Bay, Nassau County Police Department said Noone would leave an unpaid position as assistant commissioner to which he had been appointed by former County Executive Edward Mangano. “Since we have not required [Noone’s] services and since he will be appointed to the town ... we have requested his resignation so there is no conflict of interest,” a police spokesman said in an email. Noone said on Thursday it had been an honorary position and he had resigned.